Heirloom Tomato Plants Organic Heirloom Tomato Plants,Tomato Seeds, Heirloom Tomato Seeds. "Life is short, my gardening friends. Dig deep into the Earth and dream of a bountiful harvest." Welcome to the astonishing world of heirloom tomatoes! We are your Southern California source for 100 luscious varieties of organically grown heirloom tomato plants, a couple of carefully chosen great-tasting hybrids, plus a fine selection of gardening products for your garden and for growing in containers and greenhouses. 2019 will mark our 19th year shipping tomato plants right to your garden. My gardening career began in 1954 when I was 4 years old. I dropped a pumpkin seed into Grandma and Grandpa's bird bath in Idyllwild, California. It sprouted. Ah, germination. I was hooked. Forever. Now I'm almost a grown-up and still thrilled by watching a seed pop and become a beautiful little plant. It grows big and gives us fruit, then the seeds from those fruits give us teeny plants of the same magical variety again and again and they grow and grow, year after year. This is the miracle of germination. Our 2018 gardens produced one of our best crops ever! Green Giant, Lavender Lake, Momotaro, Brown Derby, Dirty Girl, Super Snow White, Ruby Gold, Tati's Wedding, Jutland, Queen of the Sea, Paul Robeson, Marianna's Peace and so many more! We harvested hundreds of tomatoes and they're still goin'! We grow and ship about 30,000 tomato plants all over the USA every year, year round, to all 50 US States and Territories. Come see us on Facebook for the latest news, plant care and events. BLT made with one slice of a Bear Claw tomato, from Dan Hornbaker in New Jersey. Click see what we've got for you! Monday - Friday, 9:00 to 5:00 - Pacific Time. Taking care of our babies--rain or shine! 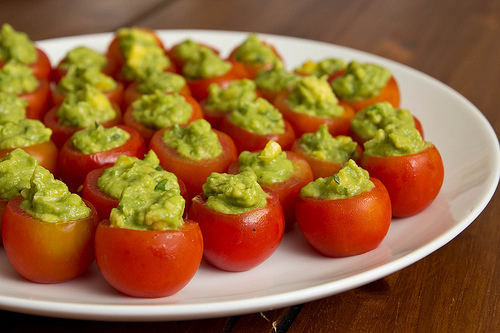 Try making these with an array of 5 of 6 colors of dazzling cherry tomatoes! Come see all the new ones and the old favorites! Click the link to see The Big List for 2019 with prices, descriptions and photographs of our varieties of tomatoes for spring and summer along with detailed information for placing your order. IMPORTANT NOTE: We ship Post Office Priority Mail -- but we will ship UPS if you cannot get post office deliveries to your house. If you cannot receive Post Office packages on Saturdays please let us know and we will be sure your plants do not arrive on a Saturday! We are happy to ship to PO Boxes, no problem. Because plant prices do not include shipping and handling, please take a moment to familiarize yourself with shipping costs before ordering. This important payment & shipping information includes a detailed explanation of shipping and packaging costs and techniques and our guarantee. Growing Tips and Garden Products Laurel's best growing tips, organic gardening products, SmartPots for your container garden and all organic plant nutrients and pest and disease control. Plus, learn how to easily and successfully grow even the largest tomato plants in containers. Join us on Sundays in March, April (except Easter), May early June to choose from more than 70 varieties of tomato plants and our selection of fine gardening products including 3 sizes of Smart Pots, organic fertilizers and natural, effective insect and disease control, along with TomatOH! Holders, the best tomato cages! Gift Certificates Will This Be a Gift? Laurel's Heirloom Tomato Plants offers personalized gift certificates for all occasions. Our gift certificates are themselves an elegant gift. You may choose certain varieties, or a certain number of plants or a dollar amount for your recipient's certificate. Discover why heirloom tomatoes have the fabulous old-time tomato taste you remember or may have never experienced. Are Tomatoes Really an Aphrodisiac? A definitive answer to this age old question. A Photo Gallery of some 'Stranded on a Deserted Island' choices ...a few of Laurel's favorites. Let's party at John Sauln's house! Part of his harvest, summer 2014. Yum. Our Tomato Varieties and How to Order - See all of our heirloom tomato plant varieties. Go to www.tomatofest.com Click for seeds instead of plants! 600 varieties of heirloom tomato seeds. Smaller Plants for Containers ....and small garden spaces. Favorite Tomato Recipes Great Recipes for your heirloom tomatoes! The Best Tomato Sandwich Great sandwich recipes from our customers! Laurel's Blend Olive Oil My Favorite! Favorite Links ...Featuring some excellent resources! Help For Your Loved Ones Who May Wander. Click: Go to Tomatofest.com for 600 outstanding varieties of certified organically grown Heirloom Tomato Seeds! We are delighted to present our Laurel's Blend Olive Oil blend again for 2019. Golden, mellow, smooth and buttery with a discreet touch of earthiness to complement your heirloom tomato harvest, this superb quality, award-winning Extra Virgin Olive Oil was created by our friend and fellow heirloom tomato fan, Kevin Tazelaar, Founder of California Gold Olive Oil Co. in Oakdale, California. Kevin sent us little bottles of different blends to try in a blind taste test. After many tastings, I chose my favorite; Kevin had it bottled and surprised us by naming it Laurel's Blend. In the photograph you will see that some of the oil is missing. While shooting the photographs, I lost my mind, opened the bottle and had some for a snack with fresh-picked tomatoes, Greek olives and feta. I couldn't stop myself. You will get a full bottle, we promise. Back for 2019, Great Big Tomatoes! Great Big Tomatoes Natural Liquid Compost, The Energy Drink for Tomato Plants. It's a concentrated liquid compost to give your plants extra growing power, and is, of course, all organic. Use it in addition to your fertilizers. Great Big Tomatoes has really impressed us in out garden with heartier, stronger stems, healthier lush foliage, bigger, better, yummier tomatoes and extremely healthy soil and our customers concur! You will find it here on the Growing Tips and Garden Product page. Quarts and Gallon size! Get the most from your tomato plants with Great Big Tomatoes! Now in two sizes, one quart and one gallon. We have 25 gallon and 30 gallon Smart Pots for most of our heirlooms along with the 10 gallon size for our dwarf varieties. Just add a tomato cage or other support. These are inexpensive but durable heavy fabric pots used by professional nursery growers. They last for at least 5 years. Folks went crazy for these at our on-site sales here at the nursery. Perfect for growing tomatoes or any other crop for container gardening. Lightweight and durable enough for years of growing, they fold flat for easy shipping. Here is Oliver W. Holmes guarding his owner Bob Holmes's tomato plants in Dunmore, PA. Good boy, Oliver! Growing in a Colder Climate or Planting Early? Early-Start Plant Protectors. 18" tall water-filled teepees to insulate your plants and soil against frost and cold temperatures. Start tomato plants and all your warm weather plants a month or more earlier than usual. Our customer Diane Fagerberg's tomato plants in Fort Collins, Colorado after a late snow storm in early May. She heard the weather report and covered them with Plant Protectors and inverted Smart Pots. 19 inches of snow fell! The temperature dropped to 16º F and the water in the Plant Protectors froze solid for 3 days....oh no! Surprise! Diane's plants were alive and healthy after the storm and produced a great crop of yummy tomatoes. Yay, Diane! Here's How to Order Plants! Order By Telephone or Email. Easy as 1, 2, 3. Our Tomato Varieties and How to Order Choose your plants and shipping period. Growing Tips and Garden Products Choose your fertilizers and garden products. We are in Los Angeles, California. Tomato plants start shipping in mid to late February to US destinations throughout the year to suit your climate. Ordering begins in late August and continues through June for 2019 planting. Plants will be shipped when the weather is just right for planting in your town or earlier if you wish. If ordering for extremely early shipping we can triple insulate your plants a so they do not freeze in transit. Minimum order is one plant if paying by check. For credit card or PayPal orders, 4 plants. Orders of 64 plants or more receive a volume discount. We do not sell wholesale. We do not sell plugs. Gift Certificates are available year round. Our tomato plants are lovingly grown from seed, using careful 100% organic methods and shipped to you in their large 4" deep nursery pots. Do you live or work in Southern California? To find your average temperatures click here www.weather.com or another weather site to explore the temperature graph for your city's month-by-month highs and lows, and determine your optimal planting time when the average low temps stay reliably above 50º. That is your best planting time. About Frost Dates. Don't plant in cold soil! Tomatoes are a hot weather crop. Hot...not "starting to warm up". You can usually plant safely about 2 to 3 weeks after your last predicted frost date. Most new gardeners plant too early. When the soil is cold, the plants go dormant. Dormancy weakens your plants forever--they never quite catch up or recover completely and often do not produce well or ripen properly. Be sure the nighttime air temperature is reliably 48º to 50º or above and the soil is reliably warmed up to above 50º or your plants will go dormant and just sit there in the cold soil, staring at you and not growing until the weather warms up. This dormancy stage makes your plants very susceptible to disease and insect damage, delays fruit set and reduces yield. You can warm the soil for a few weeks before planting with clear plastic placed over the garden bed to absorb solar heat from the sun or use our Wall 'O' Water plant protectors and plant safely 3 weeks earlier than usual! Be patient; wait until it's warmer and you will be rewarded with robust happy tomato plants and a good harvest. The most important thing to keep in mind is that night temperatures and soil temperatures should be steadily above 50º before planting tomatoes. Pollen becomes sterile at continual daytime temperatures higher than about 96º and nighttime temperatures above 72º, so don't expect fruit to set during those times. The plant knows that the pollen is not viable and drops the blossoms. When the weather settles down, the blossoms will stay on your plants and produce fruits. We do have a few varieties that produce at higher temperatures. Shipping is normally timed for when your nighttime temperatures stay reliably above 52º, or earlier if you desire. We have Plant Protectors -- water filled 18" tall teepees -- which absorb solar heat during the day and release it gradually during the night to keep the air around your plants warm. This means you can plant a few weeks earlier than usual. Click here: Growing Tips and Garden Products for detailed information on planting. Tomato planting here in Southern California, and in many areas of USDA zones 10 and 11, or Sunset Magazine zones 22-24, begins in latest March depending on our night temperatures. If the ground is below 52º, we use season extenders or wait until April. Hey, Laurel! My Garden Center is selling plants in early February...it must be time to plant! Yes, I know the local garden centers have plants for sale here in February. Why do they do this? Some folks have greenhouses. Most do not. You plant in bitterly cold soggy February soil and here comes the wicked winds of March. Of course the little plants don't make it in the cold weather or get diseased and die so you go back in April for more plants thinking you did something wrong. You didn't. You were tempted. You caved. But that's tomato love. Try to control yourself and wait until it's steadily above 50º at night. We ship your plants during a 2 week period of your choice. For instance, if you choose the April 15th Period as your shipping period your plants will ship between April 15th and April 29th. Orders are shipped first in, first out. We will help you choose the week when your climate is perfect for tomato planting. For example, if you order in January for your Minnesota garden, we ship your plants at the end of May. If you wish to experiment with growing in cooler temperatures we will ship them earlier with a disclaimer that they may freeze in transit and are not guaranteed to arrive alive. Do you need advice about planting tips, soil preparation, trellising, fertilizers, etcetera? We know how important it is to get good advice and we want to be able to continue offering expert advice about choosing plants and gardening tips. For all customers: when you place your order we are happy to offer a basic 10 minute consultation at no charge whatsoever when we take your order and throughout your growing season. Specialized, detailed consultations involving research are $150.00 per hr. If you do not place an order and do not plan to, consultations are $180.00 per hour. For customers needing a specialized consultation by phone which requires detailed research into your climate conditions and advice in creating a garden in your particular climate, including soil conditioning, the best time to plant, season extenders, landscaping ideas, plant lay-out, detailed variety selection, fertilization techniques, or how to grow for market, etc., my fee is $120.00 per hour, minimum of one hour. We do not do on-site consultation or landscaping. Ordering is in full swing! To Order By telephone, email or fax, see Here's How to Order above. We do not have a retail store or walk-in hours. 600 outstanding varieties of organically grown Heirloom Tomato Seeds. Black Sara, Chuck's Yellow, Gary Ibsen's Gold and The Dutchman. Laurel's Heirloom Tomato Plants offers several different styles of personalized and customized gift certificates for all occasions. Our gift certificates are themselves an elegant gift. You may choose certain varieties, or a certain number of plants or a dollar amount for your recipient's certificate. Laurel will personally create and send or email a beautiful full-sheet antiqued parchment gift certificate for any occasion: All holidays, Valentines Day, birthday, wedding, anniversary, graduation, promotion, Christmas, Kwanzaa, Hanukkah, house or garden warming, sympathy, congratulations, remembrance, or just pure tomato love. Your recipient's Personalized Gift Certificate will feature a full-color array of 12 beautiful heirloom tomato photographs printed on full sheet parchment, along with your personal greeting of any length. $6.50. If you will be selecting specific varieties for your recipient, Laurel will add additional full sheet antiqued parchments printed with detailed descriptions and full color photographs of each tomato you choose. This stunning certificate is a spectacular gift in itself. $12.50. For more than 1 page of photographs, additional cost is $2.00 per page. Shipping charges will be included, so your recipient will be free to relax and choose from more than 75 varieties of heirloom tomato plants and garden products. Plant cost will be averaged at $6.95 each so your recipient can choose from among our more expensive plants. You may also select a dollar amount in $10.00 increments beginning at $35.00. These elegant full sheet certificates add a heartwarming touch to your gift. Your recipient and Laurel will get together and determine the perfect shipping week when the weather is just right for planting in their garden. Laurel will be happy to personally assist your recipients in choosing plants for their climates and preferences when they call to redeem their certificates. The Personalized Gift Certificate on Parchment, $6.50 plus postage of $5.05. The Personalized Gift Certificate on Parchment with Detailed Descriptions and Full Color Photographs, $12.50. Gold Medal Yellow, Kellogg's Breakfast, Marvel Striped, Grandma Oliver's Green & Vintage Wine. Click for 600 varieties of heirloom tomato seeds! Visit TomatoFest® for TomatoFest Garden Seeds ~ the world's largest and finest selection of more than 600 varieties of certified organic heirloom tomato seeds, gorgeous photos of luscious heirloom tomatoes for your garden, the very best in gardening supplies and organic gardening information. Favorite Links ~ click for some cool resources! Purple Haze parentage line, Purple Haze single fruit, Purple Haze sliced and sliced Laurel's California Gold and Laurel's California Gold blossom-end photographs are the property of Keith Mueller and used herein with his kind permission. All rights reserved. Foxy Lady plant and group of fruit are the property of Dana Ferrin and used with his gracious permission. Green Giant photograph is the sole property of Cynthia Sandberg, owner, Love Apple Farm www.loveapplefarm.biz used here with her kind permission. All rights reserved. Bear Creek, Summer Cider, Hartman's Yellow Gooseberry, Purple Dog Creek, Todd County Amish and Chocolate Amazon photographs are the exclusive property of Lisa VonSaunder , www.amishlandseeds.com , and are used herein with her gracious permission. All rights reserved. The following photographs, and any other photographs on this website are the sole property of Laurel Garza and Laurel's Heirloom Tomato Plants or the property of other persons and entities as noted and attributed herein. and may not be used without the express written permission of the persons and entities named here. All rights reserved. The following photographs may not be used without the express written permission of Laurel Garza. 310-534 8611: Big Beef, Black Cherry, Brown Derby, Isis Candy, Eva Purple Ball, Aunt Ruby's German Green, Cherokee Purple single fruit, Dona, Black Krim, Japanese Black Trifele 3 fruit portrait, Black Plum grouped in bowl, Sara Black, Striped German, Matina, Valencia single fruit, Beiju, Bloody Butcher, Sweet Baby Girl, Grape, Sun Gold, Sun Sugar, Green Zebra, Black Zebra, Stupice, Carmello, Momotaro, Kellogg's Breakfast, Super Sioux, Stupice, Flammée, Paul Robeson-single fruit,Twin Carmello, Yellow Brandywine, Laurel Holding Jaune Flammee, Sliced Brandywine OTV, Basket Next To Heirlooms On Table, and Heirloom Tomato Montage, Laurel holding Paul Robeson plant. www.heirloomtomatoplants.com All rights reserved. All other photographs of tomatoes are the sole property of Gary Ibsen and TomatoFest.com® and used with the gracious permission of TomatoFest.com®. www.TomatoFest.com All rights reserved. Photos belonging to Gary Ibsen may not be copied or used in any way without his express written permission. 'Two Heirloom Tomatoes' watercolor painting is the sole property of artist Tom Hapgood and used herein with his gracious permission. www.tomhapgood.com All rights reserved. The images on my pages are available for viewing only and may not be used for any other purpose without my express written permission. The images may not be linked to, or posted to other websites. The United States of America provides the right and the protection of and to “Original Works of Authorship” and certain Intellectual Property works. As the Owner of copyrighted works I hold the exclusive rights to duplicate distribute and create derivative works from my works. All the text, photographs, images, products: their titles and descriptions, designs, etc. used on my web site and in the finished products which I design, create, produce, sell, etc. are protected under the U. S. Copyright Laws (Title 17, U.S. Code). I will seek, accordingly, to protect my works and rights against unauthorized use and infringement. Please note: a criminal investigation may be initiated in cases of willful infringement for profit.